"Are You A Working Mom Who's Fed Up With A Demanding Job? Wouldn't You Love To Work For Yourself And Base Your Schedule Around Your Kids?" Find An Online Job That Is Right For You! Find The Time You Need To Work From Home! Manage Your Goals And Evaluate Your Success Rate! 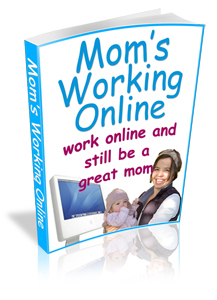 Mom's Working Online has already helped hundreds of people start a new happy life, let it help you too. Retail price of this PDF ebook is $37.00 but our price is just $1.00!